Contrary to the notion spread by free market economists close to Prime Minister Narendra Modi, who believe huge state funds are being “wasted away” on social safety net programmes meant to benefit the poor, a World Bank report says, India spends just about 0.72 per cent of the Gross National Product (GDP) on them. 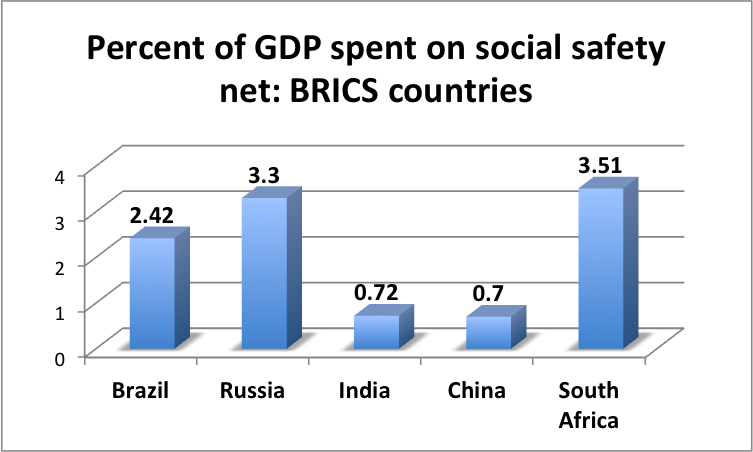 The report – which identifies India as a “lower middle income group” country – finds that all other BRICS countries, except China, spend a higher proportion of funds on social safety net. 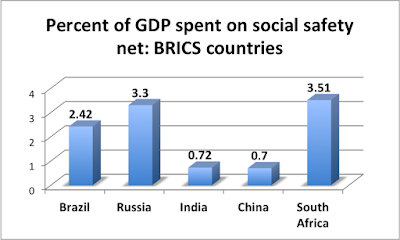 Thus, Brazil spends 2.42 per cent, Russia 3.30 per cent, China 0.70 per cent, South Africa 3.51 per cent, and South Africa 3.51 per cent of GDP. The report says, “Despite having fewer resources for social safety nets, some lower-income countries allocate considerably more funds than the 1.6 percent average for developing countries”. Thus, despite being lower income, Sierra Leone spends 4.8 per cent, and Lesotho 6.6 per cent. Among the most important social safety net programmes of India, which the report identifies, are the Mahatma Gandhi National Rural Employment Guarantee Scheme (MGNREGS), covering 58 million beneficiaries, and school feeding programmes, covering 105 million beneficiaries. 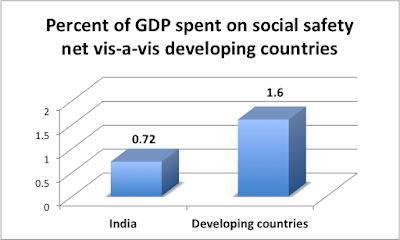 India’s other programmes included in the social safety net analysis are Janani Suraksha Yojana, Integrated Child Development Services, fee waiver for primary education and Indira Gandhi National Old Age Pension Scheme. The report, however, does not include the food public distribution system as a social safety net programme, in which India spends 0.6 per cent of GDP. Not only is the spending on social safety net programmes in India low, the government’s “roles and responsibilities” for implementing them “are often unclear and spread across multiple actors,” the report says.